Situated in the middle of an operating dairy farm, the owner had amazing options on the siting of the house. The farm overlooks the eastern Oamaru coast and the Waitaki valley and was positioned to both capture these views along with all day sun. The house is completely self-sufficient and boasts underfloor heating run off the cooker. Power and water heating is generated from solar energy with a log burner topping up the heating when needed. The log home has a relatively small footprint but has 3 bedrooms, a library, two bathrooms, a generous living, dining and kitchen area and a kids hangout/loft. Large windows give amazing views from all rooms while keeping the house flooded with light and great ventilation. The natural log features give the house a warm and inviting feel and the level of craftsmanship throughout the entire project is reflected in the finished product. 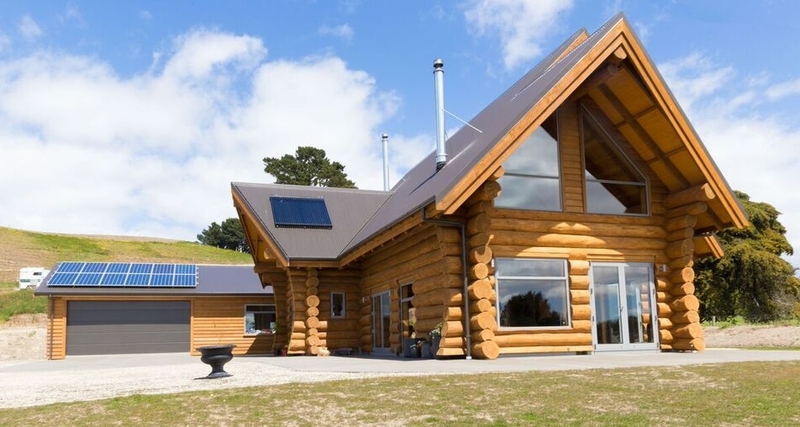 (Winners of the South Canterbury Master Builders House of the Year award, winners of the SC Master Builders Sustainability award, winner SC Master Builders craftsmanship award). CLICK HERE TO VIEW ALTITUDE MAGAZINE ARTICLE.